Can You Put Serviced Accommodation In A SIPP? I received a question from a subscriber yesterday about SIPPs (Self Invested Pension Plans) and I decided to do a quick video on the topic. If you find it useful, would appreciate if you'd like / comment / share! John Wilson here from Property Investment Blueprint. Now I just wanted to do a quick video about SIPPs. Now I received a question from one of our subscribers yesterday about SIPPs. Now what's a SIPP. SIPP as in S-I-P-P. It's a Self Invested Pension Plan and you can put property into those. It's basically a tax efficient vehicle that allows you to save for your retirement. So before I go on I will say I'm not a financial advisor. So please don't trust anything I say; check out for yourself and speak to a financial advisor. 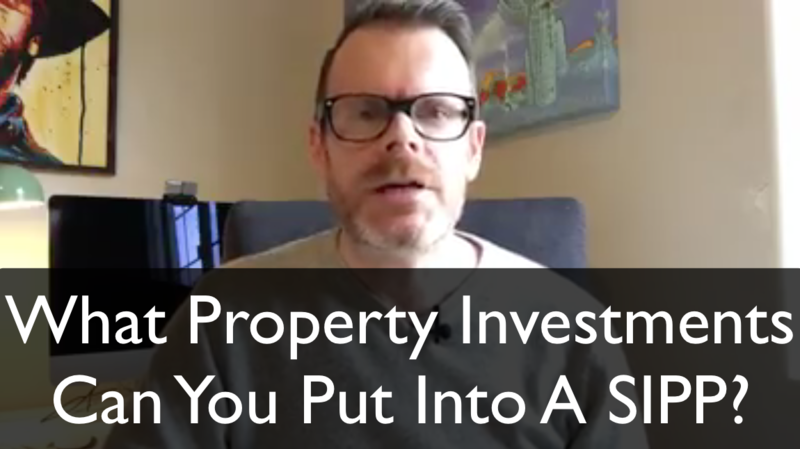 So basically you can't put as far as I know domestic property as in like a regular buy-to-let into a SIPP there was word a few years ago about some kind of investment fund that was allowing you to swap your investment. You'd sell your properties to this fund and get your Buy To Lets in there. So that way but I also saw that they had they gone bust or something. So I'm not sure if that's currently available. Anyway, I believe you can put commercial property into a SIPP. Now as far as I can tell the definition of commercial property is if you have bought property with commercial funding and are running it as a commercial enterprise. Now, the question I got was regarding HMOs. Now an HMO is a house in multiple occupation where you have your you've got a property and you're letting out the rooms on an individual basis and that's great for a cash flow point of view. You get very high yields from hmos. They are obviously quite intensive on the management side because there's often a lot of turnover of the rooms. But then I got to thinking about serviced accommodation. Now serviced accommodation could be an even better option for putting into a SIPP. Serviced accommodation is obviously where you're running the the property as a short stay type of accommodation for holiday makers and contractors and things like that. Now the benefit of Serviced accommodation is that it's you're going to get are a far higher yield for for the same property than versus if you were renting it out to a single family on an AST: just a regular lease tenancy and you can often, you know, double triple or even quadruple your profit on the same property by renting it out as a serviced accommodation unit. Now, the other thing about serviced accommodation is that most buy-to-let lenders do not allow you to to run the property as serviced accommodation in their terms. So you can't generally just swap over from a regular let to a serviced accommodation let. You can't do that. So you would have to buy using commercial lending and there are one or two specialist serviced accommodation lenders popping up as well. So buy with commercial lending. But if you're able to do that, then it's great because as a commercial property or a commercial enterprise it's not affected by the new Section 24 regulations either if you're not aware, section 24 is the new changes to the tax relief for rental property. So previously you were able to claim a hundred percent of your mortgage interest payments against your rental income for tax purposes, but that's being phased out by 2020-2021. I think so that's no longer going to be available. So serviced accommodation is going to be even more attractive because of that and because serviced accommodation, if you've done it properly then it's that's considered a commercial enterprise. So you're going to get round the the section 24 regulations. So that's a plus. You're also going to get higher income as I've already said and in my experience people treat these properties better than if, you know, you can have bad tenants. I mean you can have bad guests as well. If you're renting out as service accommodation, in my experience people treat it a lot better and there's there's less wear and tear than there would be and in a regular rental property. On the other side, you know, it is higher intensity and much more intensive in terms of management. And so you either have to get somebody to do that for you or do it yourself and just be prepared for the time that that's going to take. So yeah, that's it for this video. If you want to know more about serviced accommodation. I Do cover it in our free property course and you can get that by going to freepropertytraining.co.uk that's freepropertytraining.co.uk and yeah, if you've enjoyed this video then do share it like subscribe and I'll speak to you next time.